The boys team, from left, Coach Scott, Wittkop, Sebastian Fisher, Ayrton Svenson, Jayden Orr, Ryan Whitock, Wyatt Shipp, Zachary Falkowski, Luc LaMontagne, Coach Tovar. (Not pictured Cal Nielsen) Photo by Soo Farley. 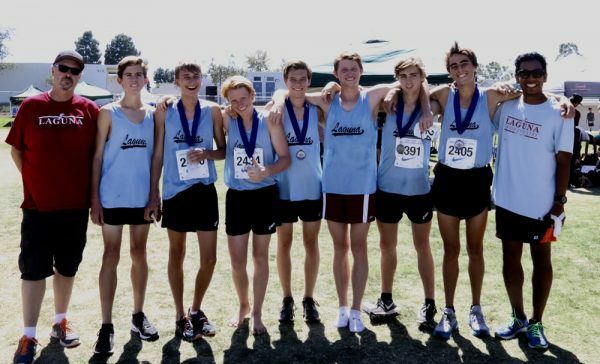 Laguna Beach High School’s varsity boys cross country team took first at the Dana Hills Invitational Saturday, Sept. 24. Top seven LBHS runners were Ryan Whitlock, 16:15.5; Luc La Montagne, 16:24.2; Cal Nielson, 16:31.7; Jaden Orr, 17:00.9; Sebastian Fisher, 17:07.3; Ayrton Svenson, 17:09.6; and Zachary Falkowski, 17:22.3.